This allows you to switch to NTP4 reference clock support. Use this option if instead of obtaining accurate time over the network from another time server, you wish to obtain accurate time from a hardware device attached to the serial port ( RS-232 interface) of your computer, such as a radio clock or GPS clock. You man also use the driver Undisciplined Local Clock which will use the computers hardware clock as an accurate reference source. This option is useful if you need all computers on your network to have the same time but not necessarily the correct time. See local clock stratum fudge if your time clients are rejecting the NTP responses they receive. Use this option to specify the make and model of your hardware clock. Supported options also include "Undisciplined local clock" and "Generic NMEA GPS receiver". The "Undisciplined local clock" option advises the NTP4 plug-in to trust the time on your computer as accurate time - useful when clocks provide native software to synchronize the local system. The "Generic NMEA GPS receiver" option is useful if your GPS system or radio clock is not specifically listed here but supports the NMEA protocol. 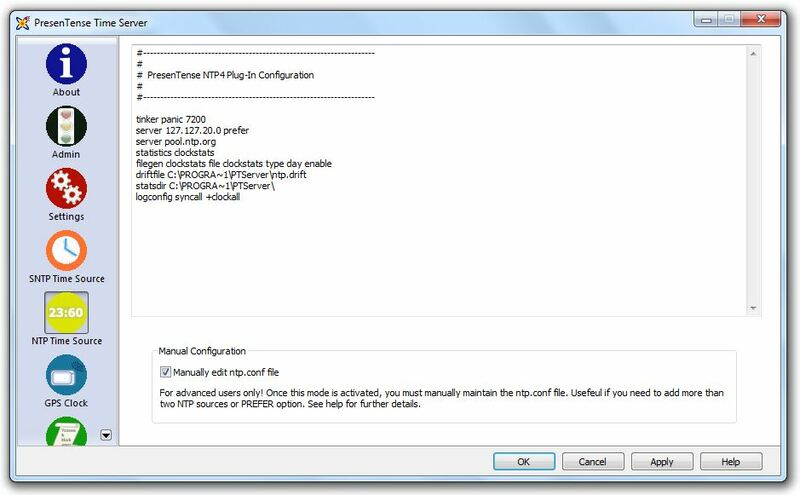 Please refer to NTP4 Plug-In Drivers for a comprehensive list of hardware devices supported by the NTP4 plug-in. Use this option to specify the serial port on your PC to which the GPS or radio clock receiver is connected. Supported options are COM1 through COM16. 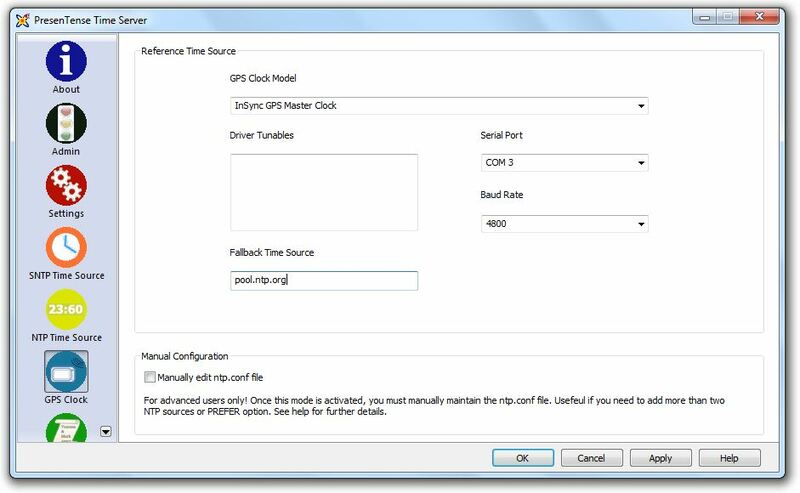 Use this option to specify the Baud rate of your GPS or radio clock. Supported options are 1200 Baud, 2400 Baud, 4800 Baud and 9600 Baud. Use this option to specify additional parameters to be passed directly to the hardware clock driver specified under "Clock Model". This option is recommended for advanced users only. Use this option to specify a fall back network time server. This time server will be used as redundant time source should your GPS become unavailable or if the quality of the time feed from your GPS degenerates. This option allows you to switch to direct edit mode. In direct edit mode, you are free to compose your own NTP.CONF file. This option is recommended for advanced users only. Once you have edited the ntp.conf file manually, you should not use the GUI to make any further changes as your manual modifications may be overwritten. Should you make a change in manual edit mode which renders your server dysfunctional, uncheck the manual edit mode, modify the GUI settings and click apply. A functional ntp.conf will be generated.